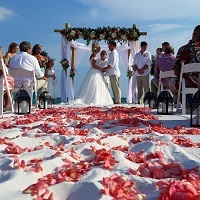 Add Full Silk Floral Arrangement to match your wedding colors to the top of your Arbor Rental. *This selection includes flowers only. Bamboo Arbor and additional décor pictured must be requested separately.